The response to the September giveaway was so good I decided to do it again. 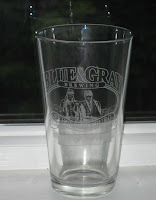 For October I'll give away one of the new pint glasses from Blue & Gray Brewery. The Blue & Gray logo is etched on to the glass so it will never wash off. To be entered in this drawing, simply submit a comment during the month of October for any post on this blog. I'll select one submission at random at the end of the month. Each accepted and published comment will be counted as an entry in the drawing. Good luck and enjoy! The randomly selected winner of the "The American Brew" DVD is Ryan Leaman of Fredericksburg. There were 54 comments posted in September, from 30 different people. Congratulations to Ryan, your DVD will be in the mail soon. Thanks to everyone one who participated. Thanks very much! I can't wait to view it. How fun, a blog that isn't about beauty products and babies. Thanks for the giveaway.